the day started with me trying to figure out exactly how much color paint i'd need to do the interior of the whole house. i took measurements yesterday, including the sizes of all the windows and doors so i can subtract them from the total. the grand total comes out to 11 gallons of paint, essentially two cans for each colors (two coats) and a special can for the bathroom, which has a semi-gloss finish. with one step closer to the promise land, i called up "volunteers" to see when it'd be a good time to get them to help me paint. i only asked the people who 1) i knew would be free (that's code word for unemployed people) and 2) who had previously said they'd be willing to come and help me paint. i'd never ask anyone otherwise, because if the table was reversed and somebody asked me to help paint, i don't know if i'd be so generous with my time. who knows though, maybe i would, beats spending the day at home pretending to look for a job. with the wheels in motion, i left belmont late (after cooking up some garlic honey mustard buffalo wings in the toaster oven for lunch) to grab some more supplies from home depot. a search for a proper ceiling paint turned up empty handed but i did buy another 5 gallon drum of primer. i also bought a pair of fire extinguishers, if nothing else, at least it gives me the peace of mind that if a fire should break out, i'd have something to possibly contain the blaze, so i don't end up burning the house down. just kidding upstairs neighbor! i have a terrible fear of the house burning down. i'll have to review what my house insurance says about fires. later, i went to the nearest fleet branch (super star market in mt.auburn) and deposited my ameritrade check which arrived today. what a relief! once again, i will be able to make my mortgage payment this month. and to have enough money to get COBRA medical coverage. screw the dental. i'll get my teeth fixed when i find a permanent job. i got to cambridge around 3pm. i saw that zuka had returned my keys, dropped them through the mailslot. today was an absolutely dreary monday, overcast, rainy, cold, miserable. i guess the weather really affected me because i had all these lavish plans for a final round of clean up before painting, but i didn't do anything of them. the only thing i did at the house was to call an appliance repairman, schedule a visit for wednesday (despite the fact that the ad in the yellow pages said same day service). it's going to cost me at least $50 just for the visit. here's how it works: if they come and don't fix anything, i have to pay them $50, but if they do fix something, i have to pay them whatever the going rate is per hour for a repairman's time, which the woman operator on the other line didn't tell me how much so i imagine it's probably more expensive. but i think i'm doing the right thing, something wrong with the gas stove, it should be fixed. how can i make spectular 7 course meals for friends and family with a busted stove? this should strike you funny because i have no cooking skills whatsoever. maybe that's where my fear of the house burning down comes from, maybe that's why i bought some fire extinguishers. instead of working, i feel asleep on the mattress in the guest bedroom, once more repeating what i was doing yesterday, downloading music and playing them while i slept. i listened to christopher walken's reading of edgar allan poe's "the raven," and then i listened to the soothing sounds of the beach and quickly fell asleep. close to 6pm manny came to the house, so i could go with him to the light 'n' leisure purple building in danvers to check out some replacement ceiling fans for his condo. the store in danvers is much bigger than the one i went to in reading, and with more selection. i saw a few ceiling fixtures that i might've been interested in, but now with all my lights already installed, i soon lost interest. although i'm not much for ceiling fans, there was one particular model that was really interesting and worth having, a fan with a giant diameter (6 feet? ), with blades that look more like sails tied down with ropes, and a motor with visible gears like a bicycle, resembling some sort of fantastic mechanical device that should be more suited for an aviation museum than inside somebody's house circulating air. seeing nothing worth buying, we left. next destination: lowe's home improvement store in burlington, the alternative home depot. neither of us had ever been to a lowe's before, and it was an interesting experience. cleaner than a home depot, the selection was pretty much the same but just different brands. a lot more appliances though. for those home renovators who can't get enough of home depot, it's worth a visit to see the nearest lowe's, like going to another country where everything seems the same but different somehow. pepsi or coke, in the end it's pretty much the same. we went across the street and got dinner at south of the border, the same mexican franchise restaurant dan and i went to that time we went to the long island ikea store. on top of the free bowls of chips and salsa, manny and i ordered the sampler, and we each had the ultimate fajita. by the time our entrée arrived, i was already full from the chips and the appetizers, that i could only really play with my food and make a half-hearted attempt at eating it. the same went for manny, although he finished all his fajita bread. we ended up taking the bulk of our dinner home, packed in large styrofoam containers. manny drove me back to cambridge where i grabbed all my things and went back to belmont. originally i had wanted to do some late night clean up, but i had to get home to work on my director project, and i was just too sleepy and full of food to do anything that demanded physical labor. 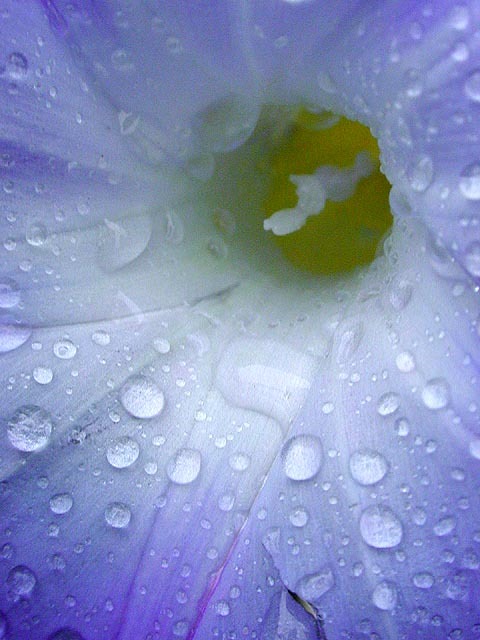 earlier in the day, when i first woke up, i was outside in the backyard while it was still raining, taking photos. while most people might seek the dryness of indoor shelters during a rainstorm, i'm the kind of guy who purposely goes outside, because, and i've said this many times, rain adds drama to normally ordinary landscapes. i took particular notice of the morning glory flowers. 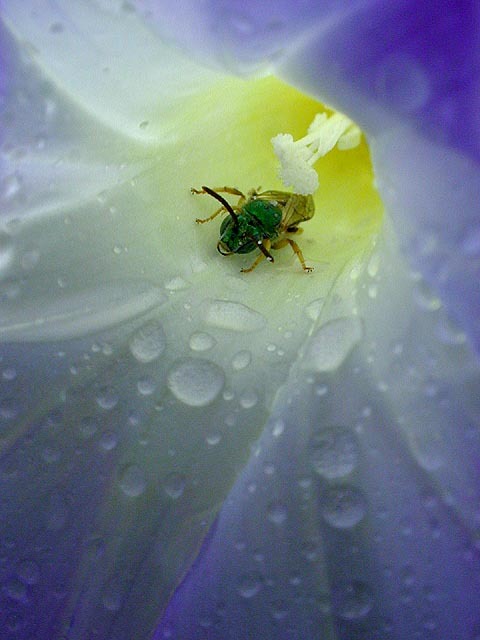 for some reason, a few of them contained a single solitary green metallic bee hiding inside the flower, waiting for the rain to stop. normally these insects are hard to capture because they're shy around humans and don't stay very still, but in the rain, in the cold, they kept motionless as i snapped a few photos.